Zoobles are the latest little collectible phase my daughter and her friends are going through. These cute little balls of fun spring into action when opened and come in a myriad of cute little characters and have an entire virtual world of fun that goes with them. They are currently the McDonalds Happy Meal toy and I found some cute Zoobles coloring pages at the Happy Meal site. 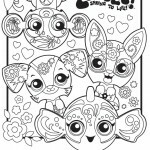 Click on the images below to view and do a quick print of the Zoobles coloring pages or visit the Happy Meal site to print them from their original PDF files. Has this trend made it your way yet?